Fiio X5 III review | What Hi-Fi? Let’s face facts: musically, our smartphones just aren’t quite good enough. It’s not their fault - they have a thousand other tasks to do. A dedicated music player has just one. As a result, if you want to take high quality audio outside your home a music player is often the better choice. That’s where dedicated players like the FiiO X5 3rd Gen find their niche. They’re as portable as a smartphone, with superior sound quality. But the X5iii doesn’t sit alone in this category, and there’s stiff competition from Onkyo, Pioneer and Astell & Kern. Fiio has taken steps to develop its product, giving it new soft- and hardware compared to the previous generations of the X5, but just how well does it hold up? Put it next to the original X5, which came through our testing rooms in 2014, and the X5iii looks like a different product altogether. The first and second generations had a clickwheel design reminiscent of the iPod Classic. This new model has a 4in, 800 x 480 resolution touchscreen. It’s a chunky device, shorter than an iPhone 7 but twice as thick. It’s ironic that while we criticised the first X5 for being too big, this new one – despite actually being bigger – feels small when compared to today’s enormo-phones. The 3rd Gen doesn’t seem fragile though, and at 186g it’s lighter than it looks. To be on the safe side, FiiO provides a leather case for added protection. Whether you’re using 3.5mm headphones or a balanced 2.5mm pair, the X5 has you covered with two jacks on its base. There’s also a coaxial output (with adapter) to connect it to a DAC. With regards to play-time, the X5 has (according to FiiO) a 10-hour or 8-hour battery life respectively, delivered by its 3400mAh Li-polymer battery. On the side of the device are the expected buttons for playback control and a wheel to control volume. While conventional volume buttons might be faster to use and more precise, there’s something satisfying about scrolling a wheel. It certainly feels good to use. Just as the hardware has been updated, the software on the X5 has been modernised too. With 1GB of RAM, the X5 3rd Gen runs a custom build of Android 5.1.1, but unfortunately it’s not an entirely stable operating system. We experience occasional glitches when swapping between apps, and the volume dropping to zero after headphones are unplugged. With its vague error messages (“An exception has occurred”), the OS isn’t as sophisticated as it might be – although these are issues that, hopefully, will be patched in future. 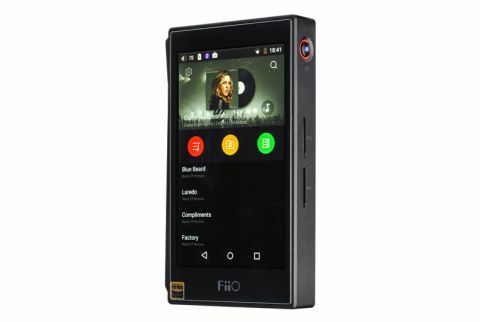 The main benefit of the Android OS is that you can download Spotify, Tidal, and Qobuz from the modified Play Store (called ‘FiiO Market’ on this device) over the Fiio’s built-in wi-fi, or circumvent the market and download applications straight from the browser. What’s more important are the types, and variety, of hi-res audio files that the X5 supports. Happily, Apple Lossless, AIFF, FLAC, and WAV files all have a home on this device, at a maximum resolution of 24-bit/384kHz for the first three formats and 32-bit/384kHz for the latter. Unless your file collection is huge, you’re not going to be short of space. The two Micro SD slots will give you a total of 512GB of storage on top of the X5 3rd Gen's 26GB of internal memory. Moving music from your computer to the X5 is simple enough too: plug it in via the Micro USB connection, tap the ‘Storage’ setting, and drag your tracks across. This is also how you activate the X5’s DAC mode, if you want to use it instead of the DAC built into your computer. You can also play your music through wireless speakers, transmitted via the X5’s Bluetooth 4.0 connectivity. But the proof of a portable player is in the performance and, on the whole, it’s pretty good. Play Michael Jackson’s Man In The Mirror (16-bit/44.1kHz) and the clicks that start the song off are clean and crisp, as are the late King of Pop’s vocals. The X5 carries off his squeals without a hitch, never feeling like it’s straining under the gospel crescendo. At the low end the drums have noticeable punch to them, and we like the assertive kicks that push the track along. Going into more bass-heavy songs like Lorde’s Royals (24-bit/48kHz), the earthy beats are textured and bloom nicely - although the Fiio is a little imprecise, slightly loosening its grip as the music becomes more demanding. As such, tracks with multiple, rapid low-frequency notes will lose some accuracy. The X5 can keep up with fast-paced tracks like Animal Collective’s bouncy FloriDada (24-bit/88kHz). This player shouldn’t have much trouble getting your toes tapping, flitting confidently through the modulated piano riffs, wooden drums and multiple vocals while keeping it all organised. And when the chorus splinters – with sounds coming from six or seven places simultaneously – the X5 ensures you can pick out each voice. Changing pace somewhat, we put on some Miles Davis tracks and it’s surprising how much detail is served up. From the amount of force being applied to the cymbals that keep time in Flamenco Sketches (24-bit/192kHz), or the small reverberations in the melancholy trumpets of Blue In Green, the X5 manages everything well. Putting the 3rd Gen into its DAC mode and loading up The National’s Sea of Love (16-bit/44KHz), this player retains its characteristics whether you’re using it portably or plugged into your computer. Matt Berninger’s vocals are warm and rich, and the volleys between him and the backing singers at the end of the song are kept tightly organised – each voice finding its own place. Supporting them, the opening drums rumble along and the texture in the hesitant, distorted guitars comes across well. However, it’s not a perfect sound - while well-organised, the sound is confined and relatively small-scale. This puts the FiiO behind rivals such as Astell & Kern’s AK70. The AK70 costs £100 more, and doesn’t have access to streaming services, but there’s more dynamism and a better sense of space to its presentation. Ultimately, it captures a song’s enthusiasm better than this FiiO. Still, there’s a lot to like about the X5 3rd Gen: its sound quality is pretty good, it supports a number of different file types, it gives you easy access to the most popular streaming services, and it’s built well too. There are a few improvements that need to be made, but this player is definitely worth a look if you need to take your hi-res audio out and about. And not being distracted by texts, emails, and Facebook alerts is a nice bonus too.